I’d love to hear more of your thoughts on this issue. And if you have friends who might enjoy this discussion, please pass this post along to them. We are among the wealthiest societies on the planet, with the shortest vacations anywhere. Yet, we’re told that our economic performance is perennially “sluggish” and “disappointing.” The real message? Work harder! We’re not productive enough! Our profits should be even greater! We’re becoming the Hamster Wheel States of America. And who’s hired to crack the whip? Commercial news media. Yes, the last several years have been tough times for many. And if you’re out of work or your company just went bust, that certainly is a crisis. But as a society, we are far from “in crisis.” Ever since the first full year of the Great Recession (2009), our economy has been growing each year — just more slowly than we’d like. There’s no question that, economically, we are firmly established on top of the world. Yet, we are never reminded that half of humanity is struggling to live on $2 a day. I’ve just finished producing a TV show about the great palaces of France. These jaw-dropping châteaux were built by the Old Regime — the 17th century version of the 1 percent. Kings would spend half a year’s income of their entire realm renovating their hunting palaces, while their finance ministers squandered much of what remained building châteaux to rival the royals’. Rivers were rerouted to power the fountains. Pavilions were perched atop the palaces’ domes for aristocrats to gather and marvel at gardens that stretched for miles. From this elite point of view, the ladies would cheer as servants flushed deer out of the gated forest and their men made the kill. The rich didn’t know what to do with all that money back then — other than to spend lots of it to ensure it stayed in their families. The First and Second estates (nobility and the church) colluded cleverly to keep down the Third Estate (peasantry). But eventually, the grinding reality of social stratification made the growing gap between rich and poor impossible to ignore. And the 99 percent marched. Today, the headless bodies of that Old Regime are buried under gold-leaf domes, and their palaces are the domain of the commoners. Imagine: After making their king “a foot shorter at the top,” the people of Paris inherited the world’s biggest palace and its best collection of art. The Louvre Palace became the world’s first public art museum. 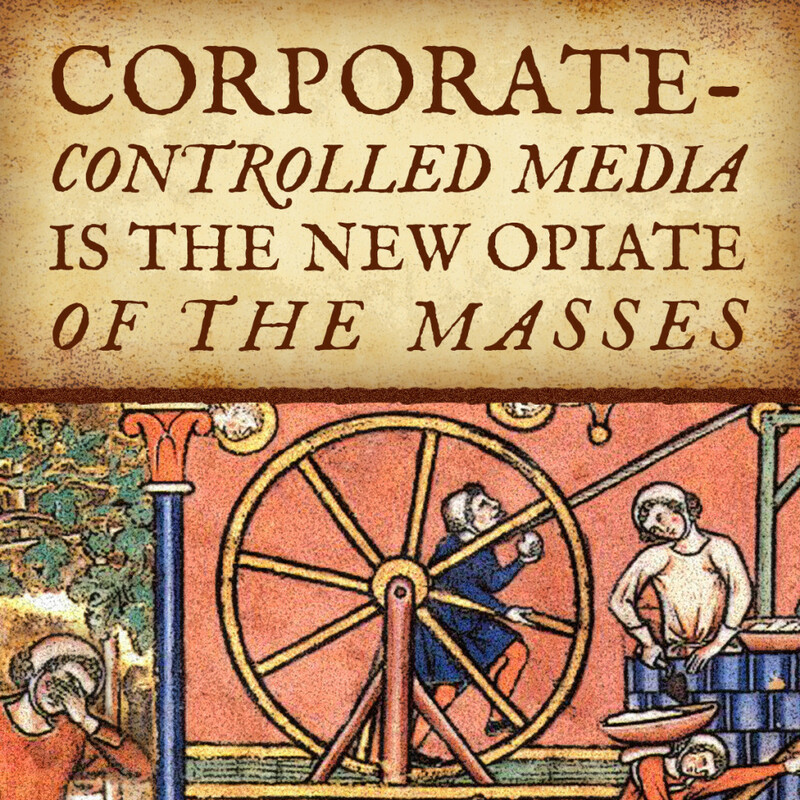 While aristocracy-controlled religion was the opiate of the masses back then, corporate-controlled media is the opiate of the masses today. And, just as those who accepted the Old Regime notion that some were born to be fabulously wealthy and the rest were born to labor, many present-day Americans just keep working harder than ever for less and less — all while the TV pundits tell us the score and prod us on. As a society, we are producing more than ever. So where are the fruits of our labor? The biggest companies in America have come out of the Great Recession with bottom lines that are healthier than ever. But what would those numbers look like if standard accounting practices addressed the real costs of their success, and the costs to make that success sustainable? That balance sheet would include needed infrastructure improvements, prorated payments on future environmental damage caused by climate change, treating our immigrant laborers with dignity, and providing the child care, health care and education that would help build a workforce of the future. I believe that, in a strong America, sustainability, economic justice, and a measure of compassion for our society’s lower rungs should be a prerequisite for corporate profit. And if corporate America knew what was good for itself — and read history — it would agree. As always, spot on Mr. Steves. Great article. I couldn’t possibly agree more. Thanks! The main thing that helped the economy is the energy sector. It thrived because cap and trade was killed. According to satellite data there has been no global warming so far this century. According to research, deaths from extra weather have declined 98% the last 80 years. You propose measures that would strangle the economy for no benefit. There is no alternative to corporate controlled media unless you want it to be controlled by government. The left already controls the mainstream media. I take it you won’t be happy until the only news is what you approve. While I understand the arguments put forth by Rick, I agree with comments left by Steve. Another major difference between the 1% now & the 1% of the 17th Century, is that the 1% of the 17th century built those palaces based on the FORCED payment of taxation to the state, not by choice as in today’s capitalistic society. This is a major difference that needs to be understood. Furthermore, the 1% today run companies that employ millions of people, making it possible for them to live in comfort and ease! These corporations are the best cures to the poverty epidemic in human history, bringing many poor people into the middle class and creating a middle class larger and more wealthy than any other class the world has ever seen. With that said, Rick your travels are inspiring and your books are very helpful, keep up the good work! I think everyone can agree that swelling the ranks of the middle class is a noble goal and needed. BUT the middle class is growing by leaps and bounds – the global middle class. The Brookings Institution estimates that there are 1.8 billion in the global middle class, which will grow to 3.2 billion by the end of the decade and 4.9 billion by 2030. How will so many people lift themselves out of poverty in a short period of time? By embracing free market capitalism and harnessing the power of connectivity and innovation that was first pioneered in the U.S. over the past century. As the U.S. continues to turn its back on these principles and seek security through regulation and entitlements provided by government that increasingly resembles an Oligarchy, why would anyone be surprised that the wealthy are able to protect their interests and the middle class is squeezed? I take issue with Steve’s use of the word “corporate America”. Too broad. Corporations are mostly owned by you and me – 401ks, IRAs, teacher’s pension funds etc. When I read Steve’s articles I get the impression that he thinks they are owned by some rich white guy in a smoked filled room. After presenting to corporate boards for many years now, I can say that is far from reality. Many corporations may be ‘owned by you and me’, but we sure pay those who sit on the Boards an exorbitant amount of money and stocks to oversee its operation. Ever leaf through the multitude of pages in a company’s annual report to shareholders listing all of the payments, stock, and other perqs that Board members receive? Another example of a market gone wild. Same for professional sports salaries, fueled by TV and cable revenue, but that is a topic for another editorial. A few years ago we spent over a $1,000,000,000,000 on an infrastructure program called the stimulus. It turned out that there were no shovel ready projects. Nor was there much improvement in the infrastructure. There is one infrastructure project that offers substantial benefits without costing taxpayers a cent. It is the Keystone pipeline. It will provide a valuable product. It will create over 40,000 jobs (and all jobs are temporary). But a billionaire leftist, who made his riches from coal, doesn’t like. I guess we’re stuck. Hmmm… comments defending the status quo. Illuminating. Thank you Rick Steves for writing this commentary. It is something that even those people who are not considered progressive might find truth in. It is the story of the past which is fast becoming today’s reality. Too many citizens of our great nation have become a bit too “fat, dumb and happy” while they listen to media rants and continue to elect congressional representatives that care only for making a buck for themselves and their big donors rather than for benefit of the people and resources they were elected to represent. This is certainly the case here in the California 4th Congressional District, which is the home to Yosemite, Lake Tahoe and millions of acres of National Forest lands. Our elected representative, Tom McClintock, (who doesn’t even live here and has only briefly visited the aforementioned areas) has just been appointed the chairman of the Federal Lands Subcommittee. Tom enjoys mocking the national parks and forestry experts at every opportunity. He is against federal protections for endangered frog and toad species. Against Yosemite West. Against raising much needed revenue for the maintenance and repair of Yosemite. He is FOR adding more commercial activities in Yosemite…like ice cream stands. He is FOR rapidly harvesting trees after major fires. Just two examples of his lack of knowledge. But as Rick illustrates, our elected politicians are just chasing financial opportunities, they aren’t representing the long term welfare of our lands and our people. As citizens, we must push away from the TV and radio trough corporate media uses to feed us our “information” and learn for ourselves how much bounty we have that is now being “reappropriated” for commercial gains. To get corporations out of media we should shut down the Corporation for Public Broadcasting. I was somewhat surprised, definitely impressed, and extremely grateful to see you take a position like this. Hopefully you will be able to reach many people that “flaming liberals” could not. Economic inequality and money in politics are the most important issues for our democracy today.